Experts in delivering year round results since 2003. We’re proud to be the longest established holiday let agency in the city. 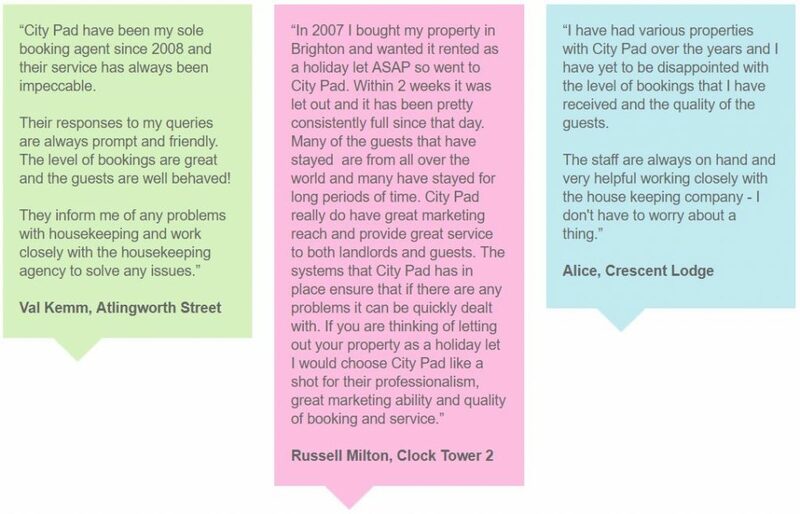 We bring a wealth of experience, knowledge and proven results making us the number one choice for Brighton landlords and guests. The lessons we have learned over the years have meant that we are experts in the local market, we know what guests want, what they are willing to pay and the strategies needed to capitalise on varying seasons and property types. In short we bring results year round for all property types. We pride ourselves on our fair rental prices which attract high occupancy and income for our landlords. We avoid overinflating prices which inevitably results in low occupancy and subsequently lower levels of income. Our properties are purposely selected by us so that we are able to offer a choice for all budgets, tastes and occasions. To reflect the demands and tastes of our very different customer groups and ages we welcome all properties that are decorated and furnished tastefully, cleaned to hotel standard, and located within Brighton & Hove and surrounding villages. The diverse range of guests that come back to us time after time never ceases to amaze us. We have a truly loyal customer base with past customers including actors, singers, conference delegates, families, students, celebrities and even royalty! Through our top google ranking website, our city centre office and comprehensive marketing campaigns we work tirelessly to generate a high level of occupancy for your property. Our friendly and experienced team deal with all aspects of your guest’s booking, from the enquiry stage, receiving payment, through to guest arrivals and guest reviews. We partner with Brighton’s 3 leading housekeeping agencies who work tirelessly to ensure that your property is cleaned to hotel standard and that once in the property your guests’ stay runs smoothly. All 3 agencies are holiday let specialists. They will manage the cleaning of your property, provide hotel quality linen, organise guest access and deal with any minor property maintenance issues during your guests’ stay. We work very closely with all 3 agencies, informing them of your bookings, liaising over property maintenance issues and guest feedback. As we work with 3 agencies you have a choice in who you wish to work with and represent your property. If at any time you experience any problems and wish to move housekeeping agency we have 2 more options available for you!